As I start to write this piece, 2011 has less than twelve days to go before the arrival of the New Year. It’s my hope that I have this posted before the New Year dawns, but I wouldn’t bet the farm on it. The close of the last year and start of this year involved a memorable gathering of Colby, Rachel, Kellan, JJ and Addie, Corey, Shelly, Lilly, Conda and I on the Oregon coast. 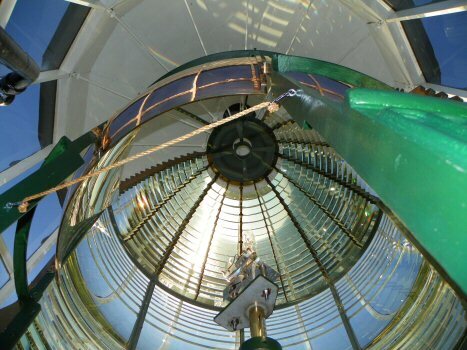 Click for our April 2011 Posting. 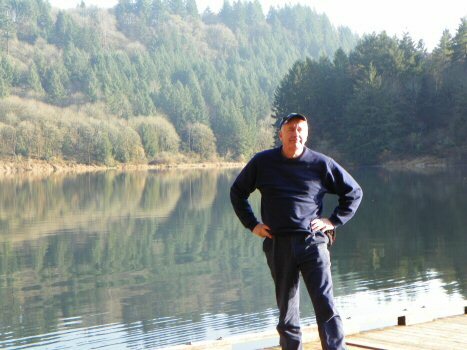 For Conda and I, and the uncertainties of employment with the State of Oregon, we have mostly been just treading water and hoping that the prospects for a brighter future will come over the horizon, instead of more gloom and doom. The sunset on 2011 and dawn of 2012 is coming or gone, if I’ve fallen too far behind, soon so we’d like to give you some idea of highlights of our year that included a birthday for a little girl and a visitor from Australia. Cassie and Tiger have become very close. 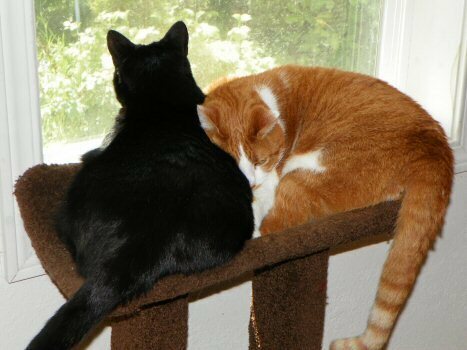 Much of the time they are snuggled up together, but they do also have their moments resulting in tufts of fur flying. Click for more Family pets & animals. 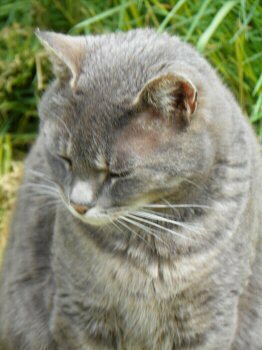 Yowie Mowie was a local stray cat we think was abandoned and decided the Walsh Family; needed a cat on duty outside. 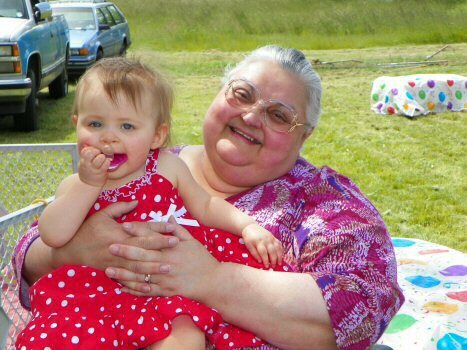 Her name came from the persistent announcing of her presence, whenever we arrive home! 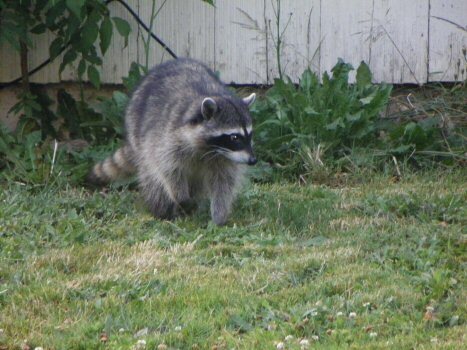 Outside security duties are shared with Yowie Mowie by a number of raccoons who will willingly share her food. 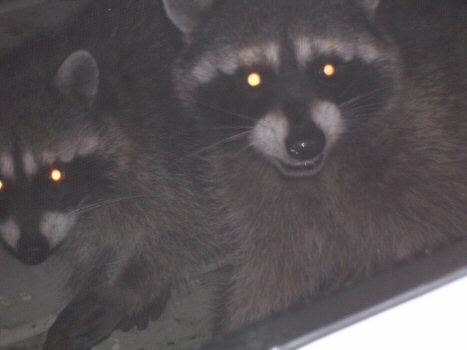 A familiar thump on the porch often announces the arrival of one or more of the gang! 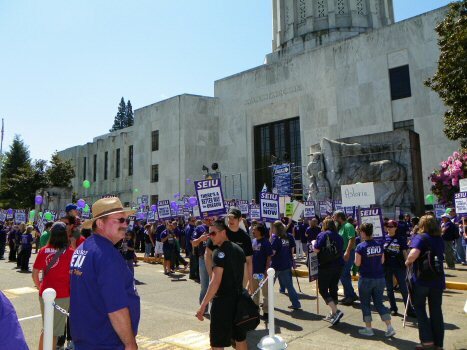 Conda and I were both involved in union activities through the year, including this rally at the State Capitol in May. 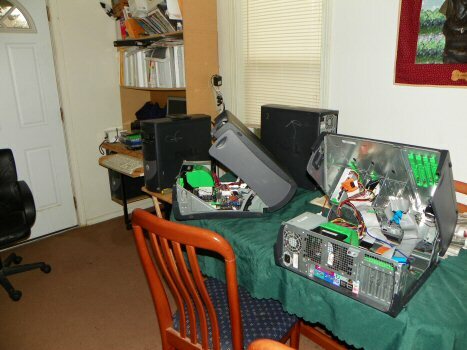 A chance bid on an auction saw me successful in obtaining 8 surplus computers that allowed me to upgrade some of our older computers at a bargain price. 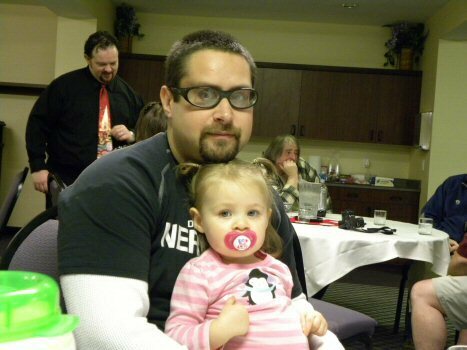 Corey and Shelly’s daughter Lilly, celebrated her first birthday in June. Of course a birthday girl must have a birthday cake. 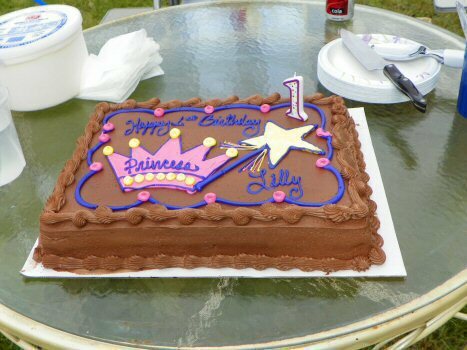 Click for more of Lilly's Birthday. I didn’t have as much time to write as I would have liked, in part due to a course I did through my job, but my first book sold slowly through the year including a Kindle Version. 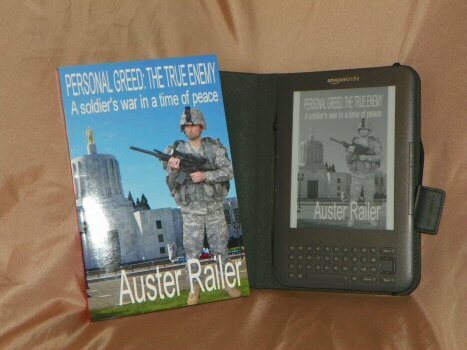 My second book is now available on Kindle with traditional copies to be printed in the near future. Click to read the first chapters. 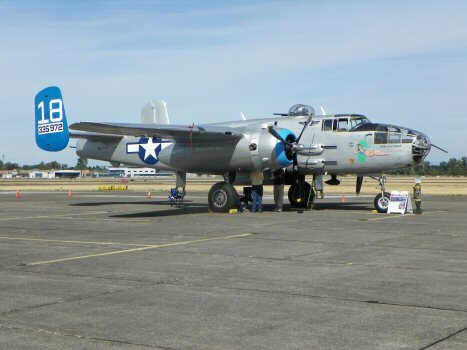 My interest in classic aircraft was well served by the arrival of two WWII bombers at Salem Airport. 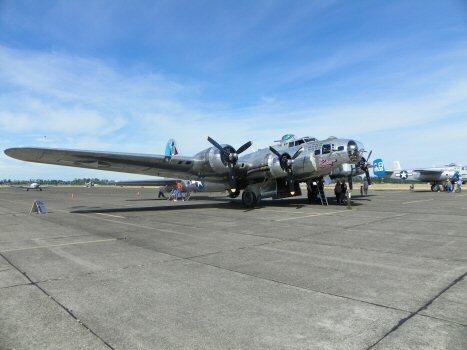 The sound of the engines, on the B17 above makes a statement that’s difficult to ignore. Although they where tools of war they seem to have more character than modern aircraft. This B25 twin engine bomber accompanied the B17 were great to see. 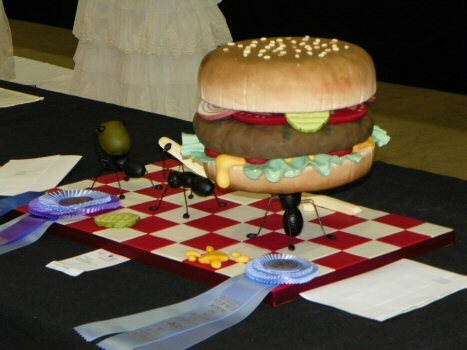 This was a cake entered in the State Fair during the first week of September. 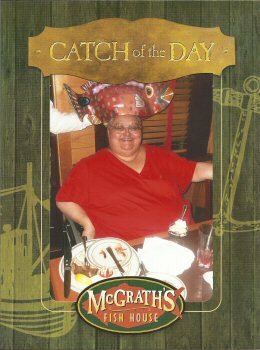 Click for more State Fair Pics..
For Conda's birthday we had dinner at McGraths which is a local seafood restaurant that offers good food and reasonable prices, and a picture with a silly fish, on your birthday! 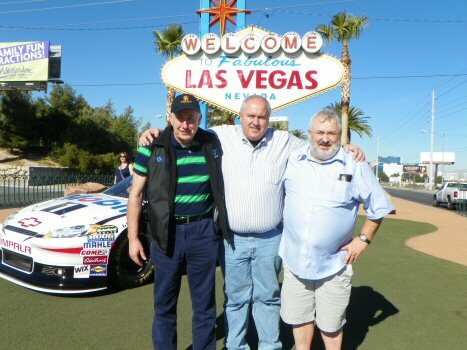 A real highlight for us, was Ken's first visit to the United States. The three of us hadn't been all together for about eight years. Ken and Peter flew up to Las Vegas and I was able to fly down to meet up and spend some time together. 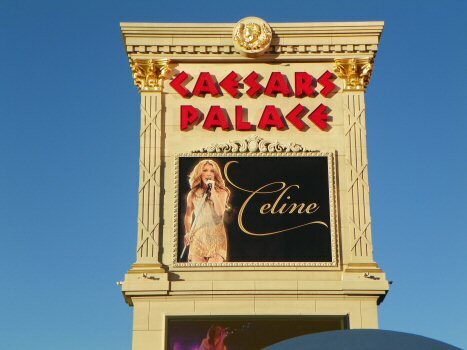 Like all visitors to Nevada's gambling Mecca, we walked up and down large sections of the strip and saw many of the attractions I'd only seen on the screen. Click for more of our Las Vegas adventure. 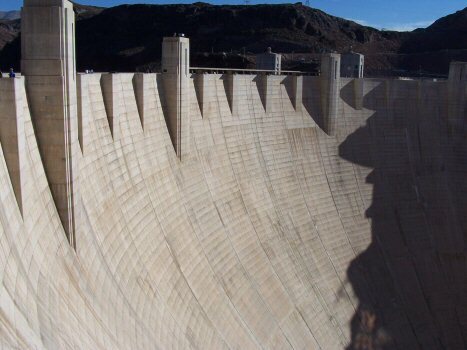 Nevada has more than gambling, including the impressive Hoover Dam shown in this picture. There will be more pictures, and an explanation why I look even more "Height Challenged" in this picture soon. 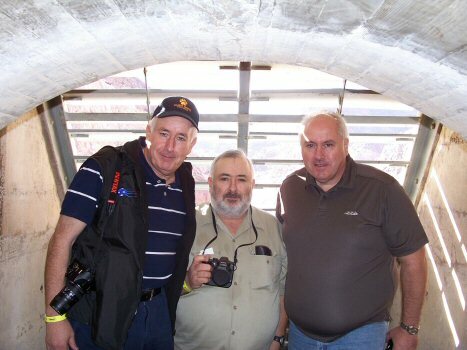 I'm waiting until my pictures get back from Australia where they went on holidays when Ken returned home! 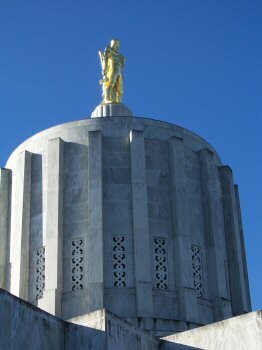 It would be remiss not to show the Salem the state Capitol to visitors from anywhere. 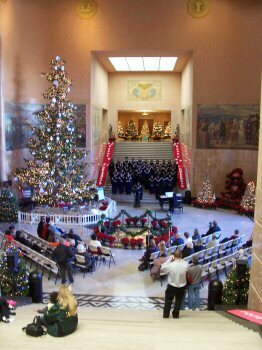 During Ken's visit they had the singing of carols under the rotunda by various groups including local school children. 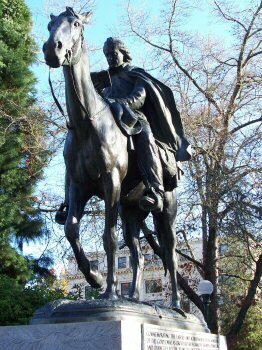 This statue, in the grounds of the capitol building is to commemorate the Ministers of the gospel who as circuit riders became counselors and evangels to the pioneers on every American frontier. 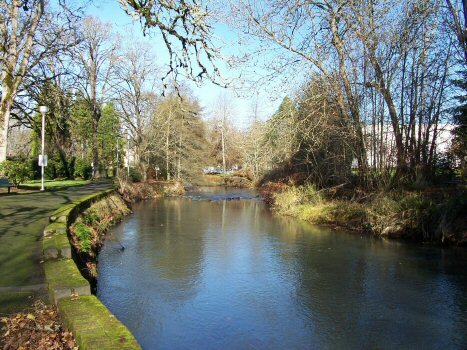 Mill Creek in Salem as it flows past Veteran Affairs Building on a fantastic late fall day with conditions much better than I expected us to have. We had a potluck to introduce Ken to some of our friends and family. 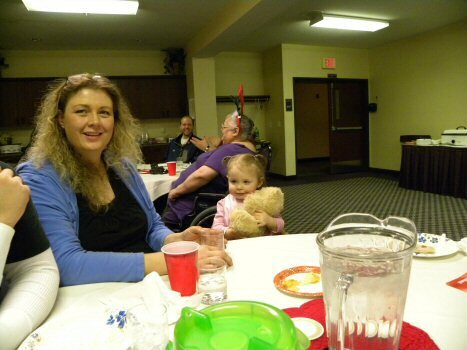 Shelly, Lilly and Lilly’s unnamed Teddy Bear were among those who came to share the day. Lilly and her Dad Corey share a moment during the potluck. 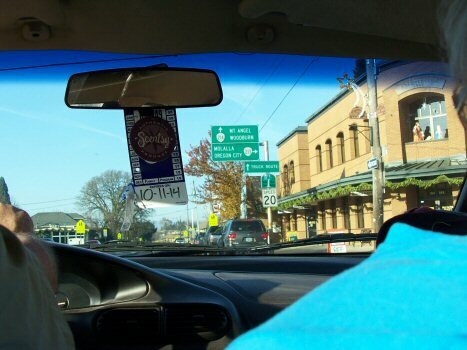 During his visit, we took a drive around the local area including the quaint town of Silverton. 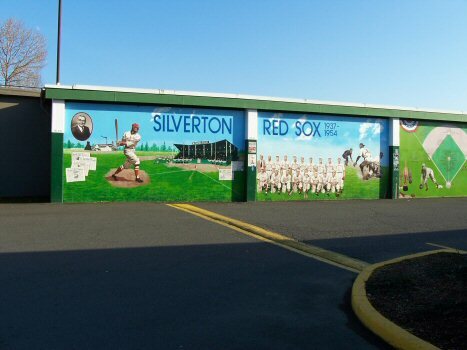 One of the features of Silverton is the many murals on the walls of buildings throughout the town. 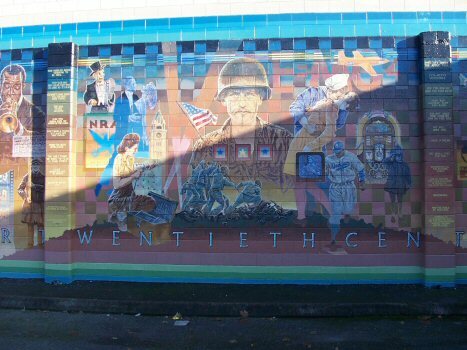 This picture is part of a mural that told the story of the twentieth century. During our drive around Silverton, included the Silverton Reservoir. Click for more Pictures of Silverton. 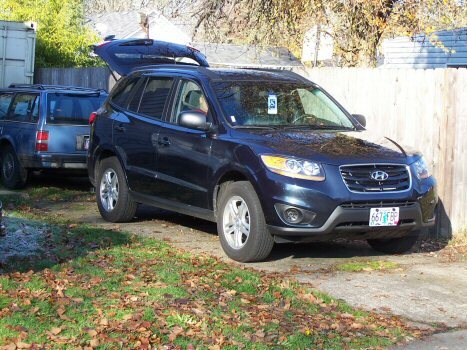 No visit to Oregon would be complete without seeing the Oregon Coast, so we mounted an expedition in this hire car we got for the occasion. 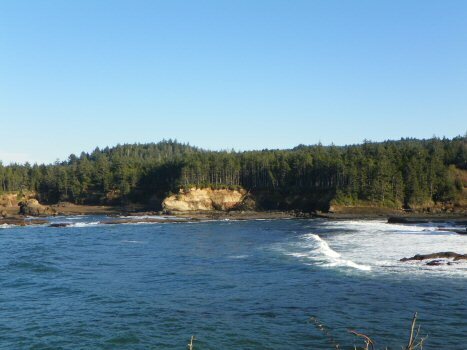 The weather on the coast continued its unseasonal fine sunny days. 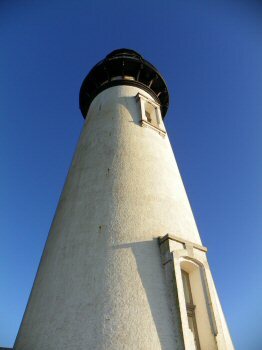 Another regular attraction to visit on the Oregon coast is the Yaquinna Head Light House. 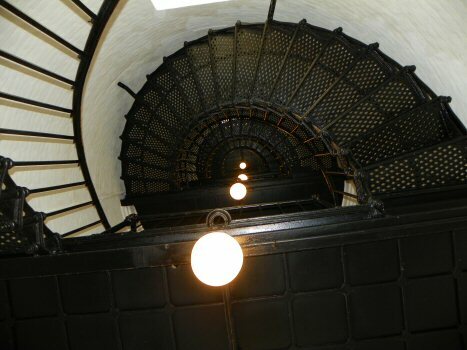 The stairs are more attractive to look at, than climb to the top. The glass lenses and light elements would take much more cleaning than I’d be willing to do. 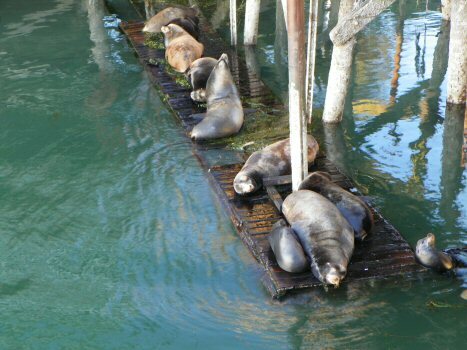 These Californian Fur Seals are also local residents of Newport. 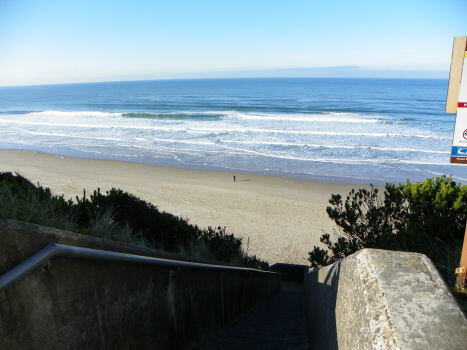 A brilliant unseasonal sunny day on the Oregon Coast at Lincoln City. That's the Pacific Ocean from the eastern side! 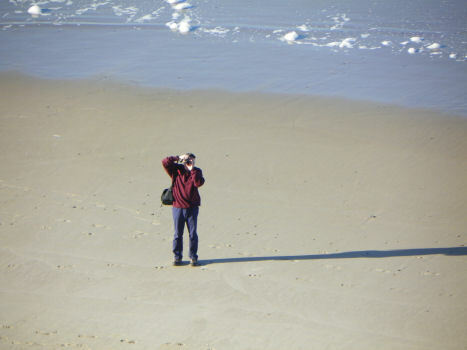 That spec in the middle of the previous picture is Ken who went town to get the real feel of the beach. 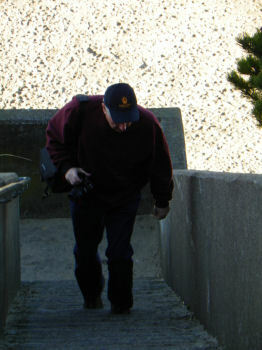 Going down to the water meant going down lots of steps! 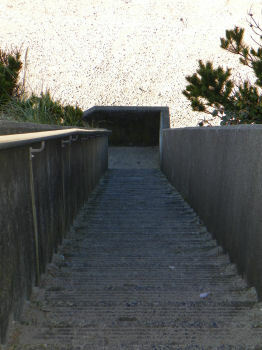 And also coming up, all those steps! 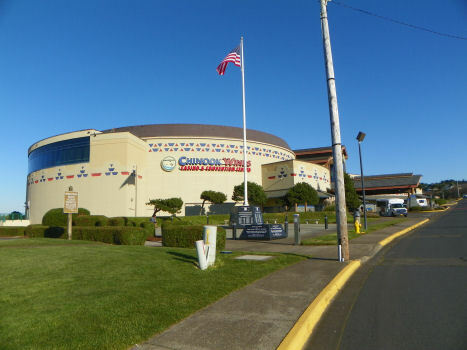 In case they were short of money I reluctantly agree to donate a small amount of money to the casino at Lincoln City, and of course sample their buffet lunch. I know it was heroic of me! 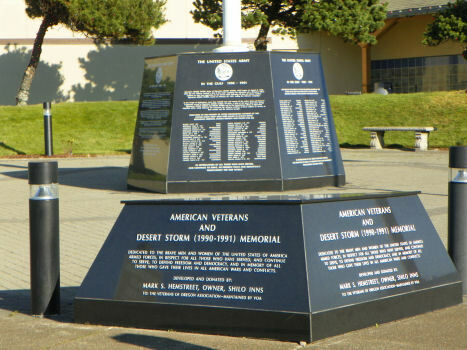 I'll never disrespect the service of any military in the service of their country, but a war memorial at a casino didn't seem right to me. It feels a bit like having a hot dog stand in the middle of a cemetery! 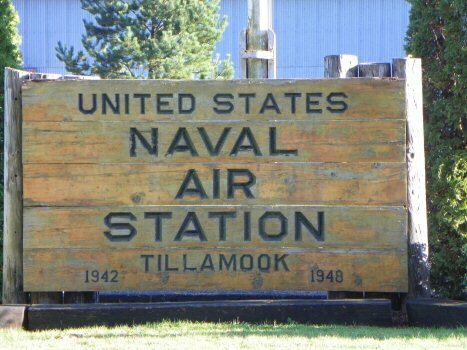 The Tillamook Air Museum is located at the former Naval Air Station in the old blimp hangar from the WWII era. 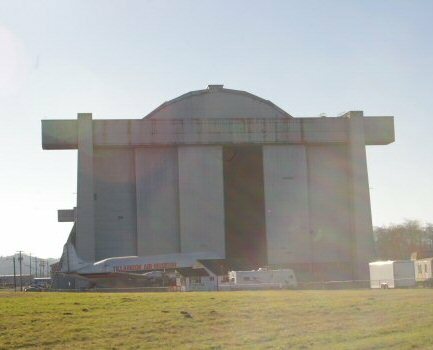 The old blimp hanger is said to be one of the largest timber structures in the country, if not the world. 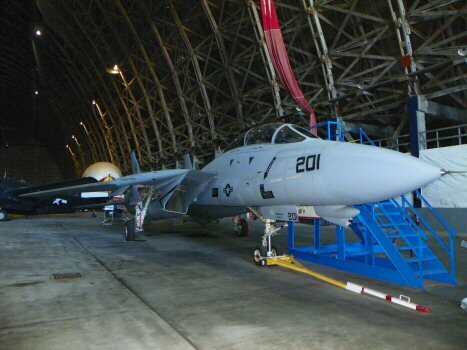 F14 Tomcats, with one shown here was until 2006, a front line aircraft with the U.S. Navy. 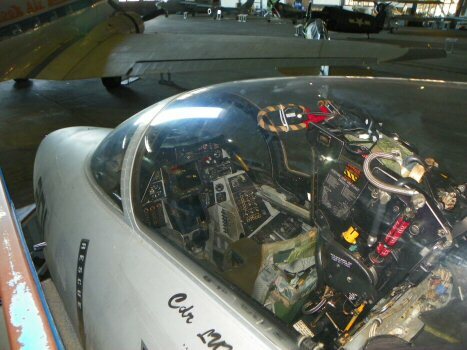 The cramped cockpit of the F14. 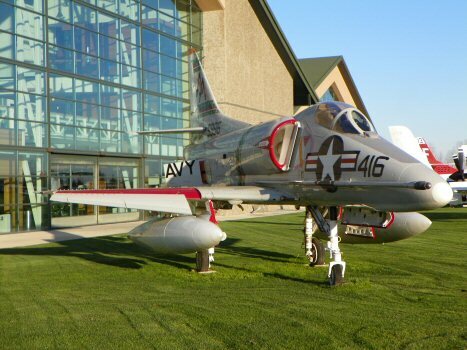 Click for more pics from Tillamook Air Museum. 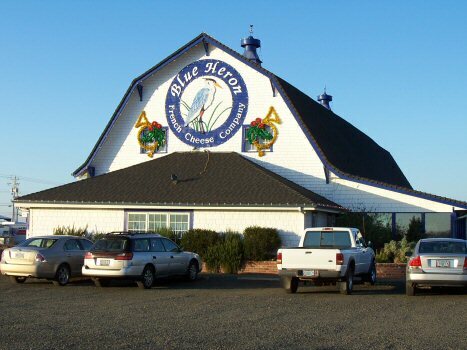 The Blue Heron Cheese Company is good for their cheese and interesting range of wines is one of our normal stops in Tillamook. 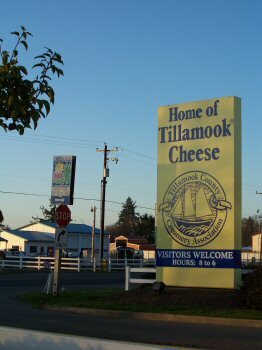 Tillamook is also the home of the Tillamook Cheese Factory. 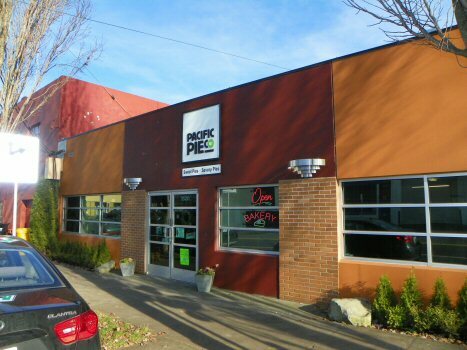 Their cheese is almost as important as their ice cream! 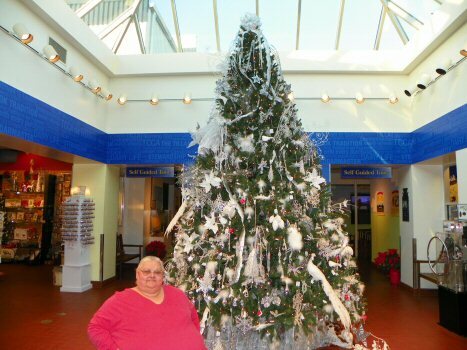 The Christmas tree at the Tillamook Cheese Factory was another reminder of how close we are (were) to the seasonal festivities. 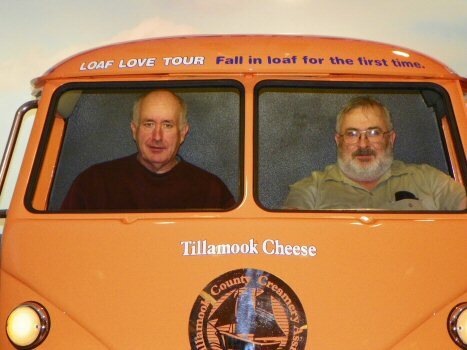 What can I say about these two desperadoes pictured in a mock up of one of their promotional vehicles! 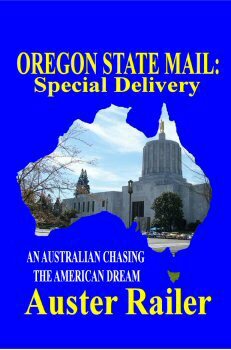 Back in the Willamette Valley from the coast we visited the Portland area and the Pacific Pie Company for some fine Australian Cuisine including meat pies, pasties and sausage rolls. 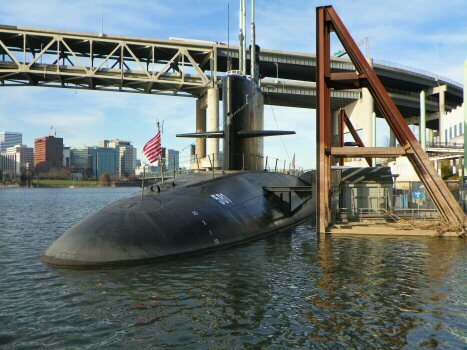 While in Portland for the Australian Cuisine, we visited the Oregon Museum of Science and Industry (OMSI) especially to have a look at the USS Blueback (SS 581) that is on display there. 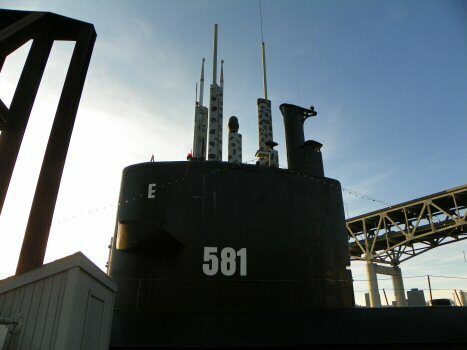 The USS Blueback was the last non-nuclear submarine in the United States Navy. 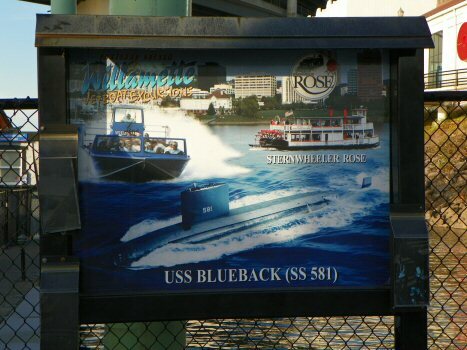 The USS Blueback has appeared in 1970s TV series including Hawaii Five-O and The Brady Bunch as well as the movie The Hunt for Red October in 1990. 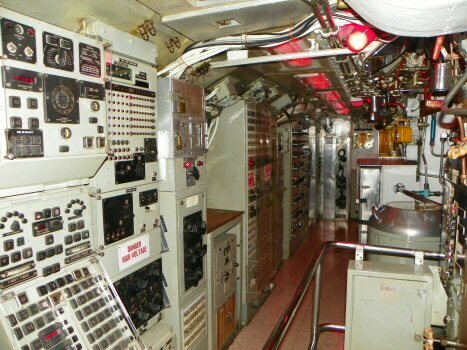 Ken and I went on the tour of the ship and found it very interesting, and cramped. 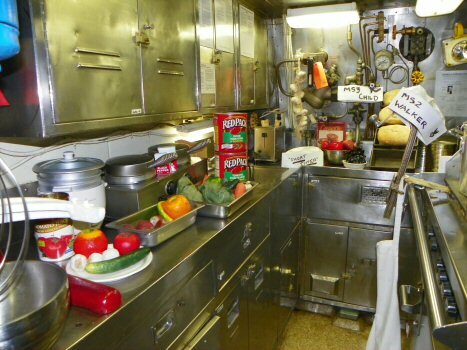 Not a lot of room to cook four meals per day to feed a crew of almost 80! 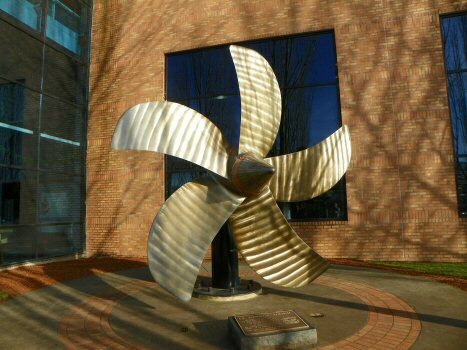 The USS Blueback’s propeller weighs about 5 tons and is part of a memorial to the submariners and submarines of the US Navy. 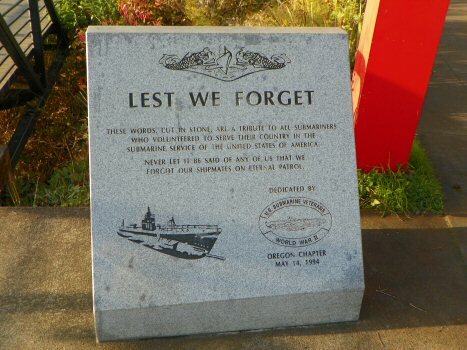 A memorial to the submariners who have given their lives, in the service of their country. 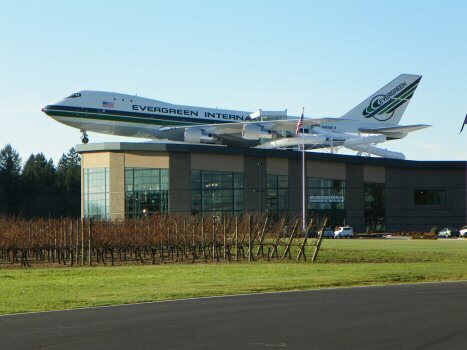 Ken has had a long term interest in aircraft that I must admit I share so we visited the Evergreen Aviation Museum in McMinnville. 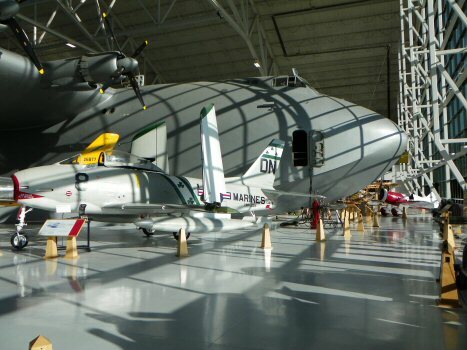 There aren’t many aircraft museums that also feature a water park. This 747 has four water slides coming from the plane down into the aquatic center below. To save time, Ken and I skipped the water slides! 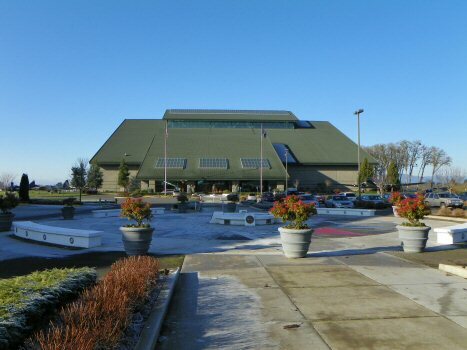 Evergreen is the home of the Spruce Goose, the legendary wooden flying boat built by Howard Hughes as seen in the background. Click here for Wikipedia's info on The Spruce Goose. 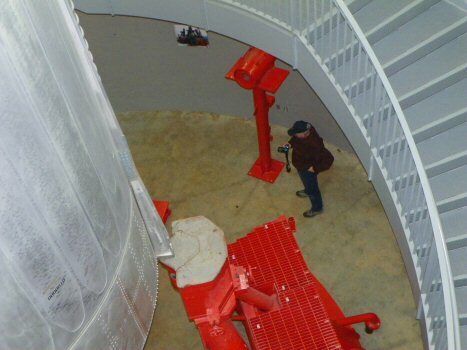 We visited Evergreen twice and still didn’t see all we wanted to see. 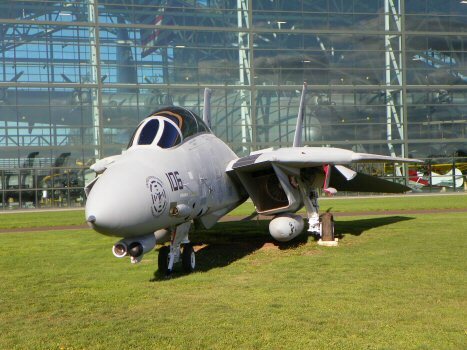 Both days provided great conditions for taking photos of the aircraft outside. 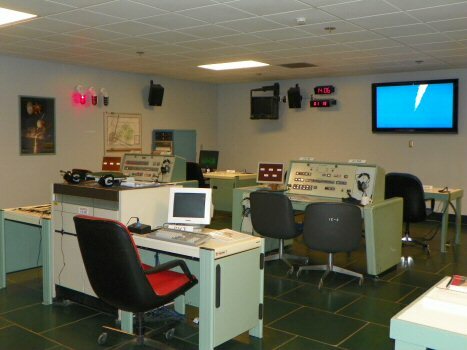 Evergreen's museum has two main parts; the section basically containing the Spruce Goose and aircraft up to the jet age, the space section that contains choppers, jets, missiles and space exhibits, including this missile control room. 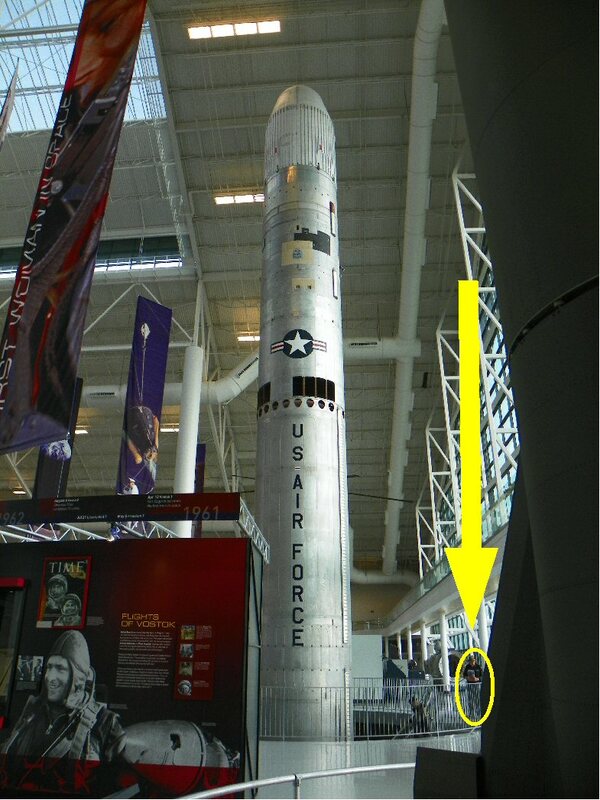 As I approach, I thought this missile was big but the yellow circle shows Ken’s relative size and gives an indication of its immense size. The previous picture didn’t show the three levels underground that make up this huge exhibit. 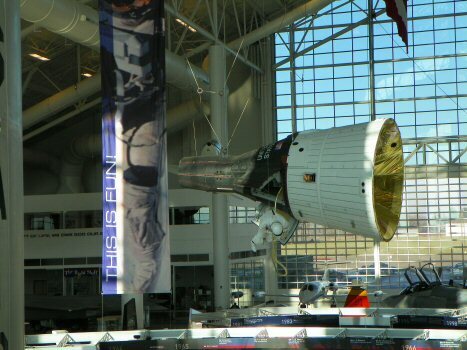 One of I believe the Apollo capsules featuring an Astronaut (a little hard to see) doing a space walk. 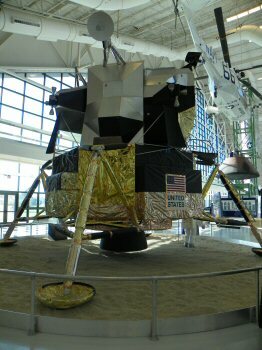 A Luna module similar to the ones that landed men, on the surface of the moon. 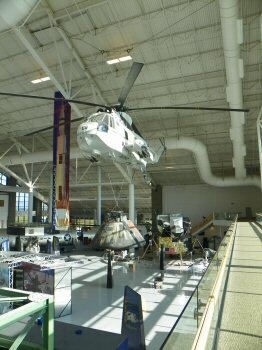 A SH-3 Sea King helicopter with a space capsule suspended below as they did during recovery after space missions. 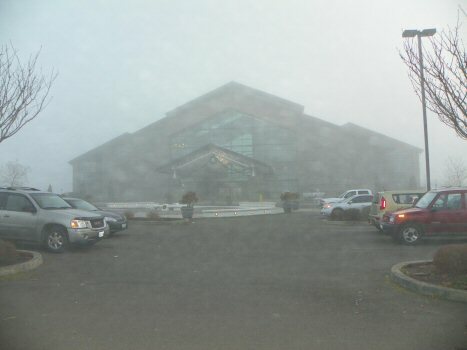 This picture of Evergreen was taken early in the morning of our second visit. It was sunny, but still fairly cold. This picture of Evergreen was taken about eight of nine hours after the previous one, showing the change in the weather conditions that day. Well, that's it for 2011, bring on 2012. We hope each and everyone achieves the success and goals they seek in the coming year and enjoy good health and the things that really matter. Take care everybody and say "Hi" when you get the chance!